Drive-thru coffee stands may be one of the greatest inventions of mankind, but sometimes you just want to slow down and enjoy the caffeinated beverage–while looking at cups of coffee on the wall, of course. These Coffee Cup Stickers might not provide much of a kick, but at least they won’t distract you while driving. 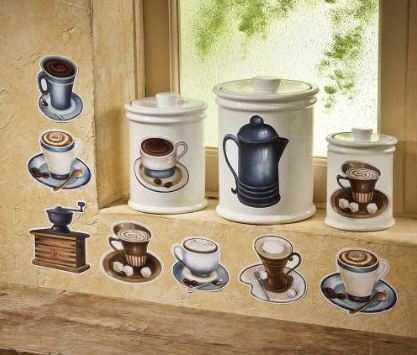 Coffee Cup Wall Stickers: Bring rich flavor to your kitchen s dcor with these coffee-themed graphic stickers. Use them to create a charming wall border or to accent canisters, windows, mirrors, & more. Paper stickers are removable so you can re-position as you like. Set includes 6 sheets, each with 8 different images. Sticker sizes range from 3 1/2″H x 3 1/4″W to 5 1/2″H x 4 1/2″W…. Not quite the same, but at least they got the old-timey percolator going on! How do I go about ordering??? I found some similar ones and updated the post. A couple of neat ones in there, but overall don’t seem as stylish — I thought the cappuccino swirl was a nice touch for the ones above. Oh, well.